Summary I Included the Fusion 360 project with this. This is my update to the robotic arm project, the old rotating base had a lot of side to side slop, and this completely redesign solves that issue by adding a bearing swashplate. For the bearings, use BB's for a BB Gun. it might also work to use Airsoft BB's but i don't have any, if you try it leave a comment so everyone else will know also. 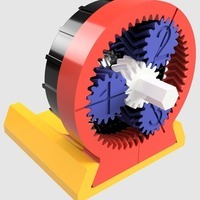 This is the gearbox to use with it: http://www.thingiverse.com/thing:2101218 for this joint, you only need Ring Gears #1 & #2 Use the one piece sun gear, and make sure you print out the 3 module long planet gears, not the 4. Link to the EZ Print Arm : http://www.thingiverse.com/thing:2153317 Link to the Original Robot Arm Design : http://www.thingiverse.com/thing:2105057 The 3rd module of the gearbox will go seemingly unused inside the top cover but it will actually be supporting top end of the planet gears. 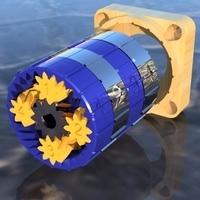 Though there IS room for the #3 ring gear to be installed, it would not support much of anything and only cause additional drag, backlash, and make the gearbox impossible to disassemble. If you use the EZ print Design make sure you use this custom center ring holder. 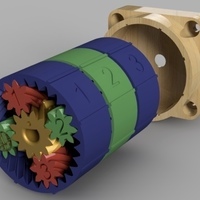 Also, the bullet-looking spacers go into the holes and work to hold all of the pieces in tight alignment, this attachment method is extremely rigid, a much better attachment than the original design. Also! i decided the best way to design the attachment for this is to turn the entire robot upside-down, which isn't much of a change. The main difference being that all of my parts listed in the EZ print robotic arm "thing" are labeled upside-down.